WASHINGTON, DC, Aug. 9, 2000 -- Saying the safety of consumers is the company’s first concern, today Bridgestone/Firestone, Inc., announced a voluntary recall of all Firestone Radial ATX and Radial ATX II tires in size P235/75R15 produced in North America, including Mexico, and Wilderness AT tires in size P235/75R15 produced at the Decatur, Illinois plant. The recall includes original equipment and replacement tires of that size, regardless of the vehicle’s manufacturer. Vehicle owners will be notified of the recall by mail. Bridgestone/Firestone will replace all of these tires with brand new Wilderness AT or other Bridgestone/Firestone tires. If necessary, the company will obtain other sources of supply. It also sparked a Congressional investigation into NHSTA (National Highway and Traffic Safety Administration) and charges that they had been asleep while all this was happening. Not to mention investigations into Firestone and Ford - what did they know and when did they know it. There has been - and will continue to be - a lot of conflicting opinions about this issue. This web page is to try to sort out the issues - as best I can - with the idea of providing all the available documentation in one place. While I am going to try to stick with what is verifiable, I do have my own opinions. It should be obvious where I am expressing those opinions. And I hope my friends at Firestone will forgive me for bringing up what must be a very painful topic. However, my interest here is in accuracy and the truth. We must learn from these lessons or we are condemned to repeat them. Were the Firestone tires faulty? Was the fault a "manufacturing defect" or a "design issue"? 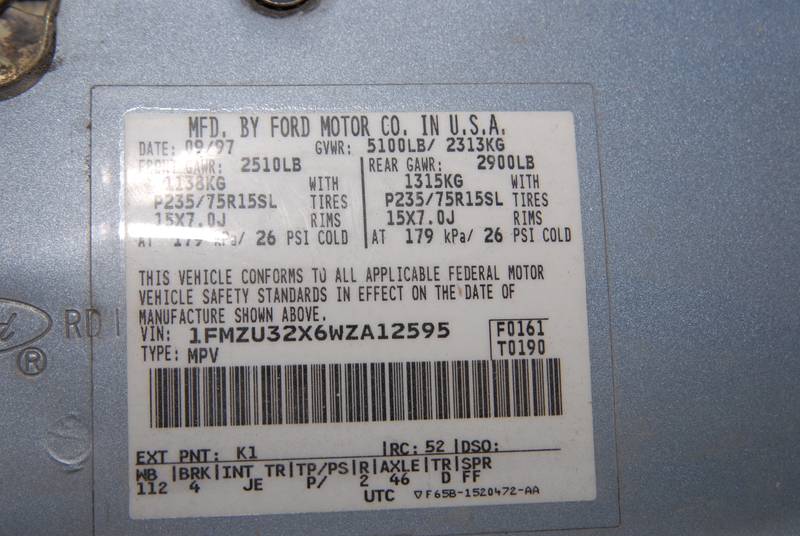 Was the Ford specified inflation pressure faulty or merely a contributing factor? Were consumers who didn't maintain the inflation pressure of their tires the entire problem? Let's start with the tires themselves. To the left is the cover page of a report written by Dr. Sanjay Govindjee, a professor at the University of California - Berkeley in January 2001. The report is 73 pages long and has a lot of information. 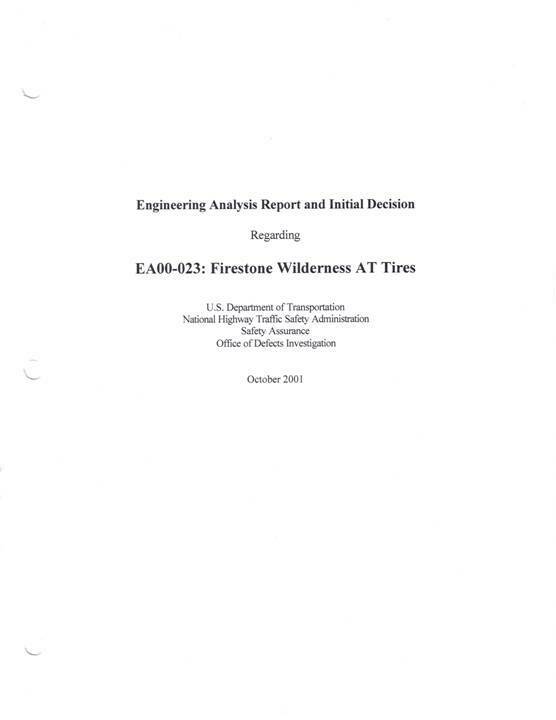 While it was commissioned by Bridgestone / Firestone - and even labeled as a confidential document - it not only is fairly frank, it is also available as a public document on the web and has been referenced by NHTSA in their reports. The following is what I consider to be highlights of that report. "Overall, it is noted that the problem at hand is rather complex, the failure rates are fractions of a percent, and thus determining a single cause for the tire failures is an unrealistic expectation." I take this to mean that the failure rates were somewhere under 1%, but since he didn't say: "a small fraction of a percent" or "a fraction of one tenth of a percent", then we can assume that the rate is above 0.1%. Based on my experience at the time this was taking place, a failure rate of around 0.5% to 0.25% seems a reasonable guess. Anything higher would NOT allow Dr. Govindjee to make that statement and anything lower would NOT have resulted in this particular tire being singled out for the level of scrutiny that took place. That is, there were other tires by other manufacturers that had failures rates approaching 0.1%, and while there was some effort to drag those into the controversy, those tires (and manufacturers) remained unscathed (and unrecalled). It is also important that Dr. Govindjee felt that there wasn't a SINGLE cause - and we'll verify that further down. 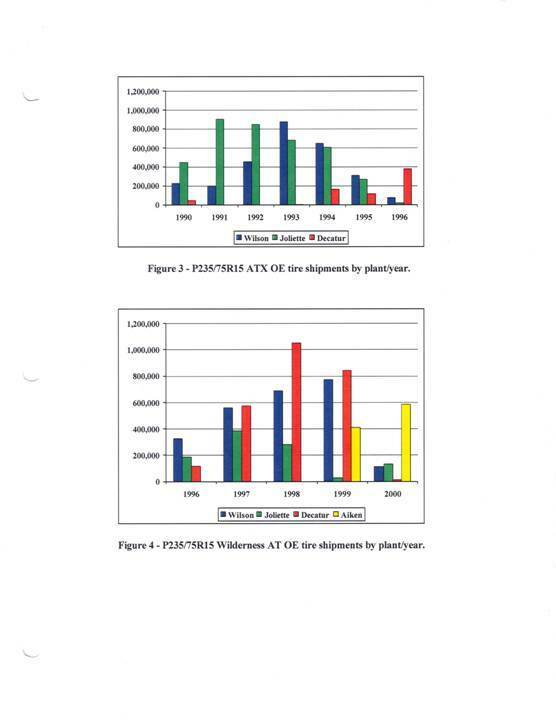 A search for the causative agent for these plant differences centered around Decatur's pelletizing material mixing stages and in particular focused upon differences in material additives. This search, however, did not lead to the discovery of a causative agent for the degraded material properties from the Decatur plant. I think Dr. Govindjee played this down too much. He did everything except conduct experiments of differing material properties with varying amounts of these additives to confirm what he already suspected. At the very least, he identified a correlation between the plants and the material properties of interest. In particular, there is enough data for the inference that the way the Decatur plant processed rubber was the cause of the low material properties. To the left I've shown a generic photo of the output end of an extruder. It is not uncommon for the final mixing of rubber to take place in an extruder. However, the Decatur plant was different than the other plants in that they DIDN'T use an extruder for the final mixing process. What is not mentioned in this report is why this problem doesn't apply to EVERY tire produced by the Decatur plant. For that we have to go to another report. The above dealt pretty much with the rubber itself, but what about the construction? Please note: It is common for vehicle manufacturers to make tire changes right along with the normal model year changes. Not only is this an opportunity to fix some issues - like noise - but it is also an opportunity to take advantage of the latest technology. I am not surprised there are so many different tire lines applied to the Explorer. This seems quite normal to me. The following points - at least to me - are the most informative of everything I have looked at concerning what actually happened and where the problem resided. To me, the most compelling things in EA00-023 are the images to the left. 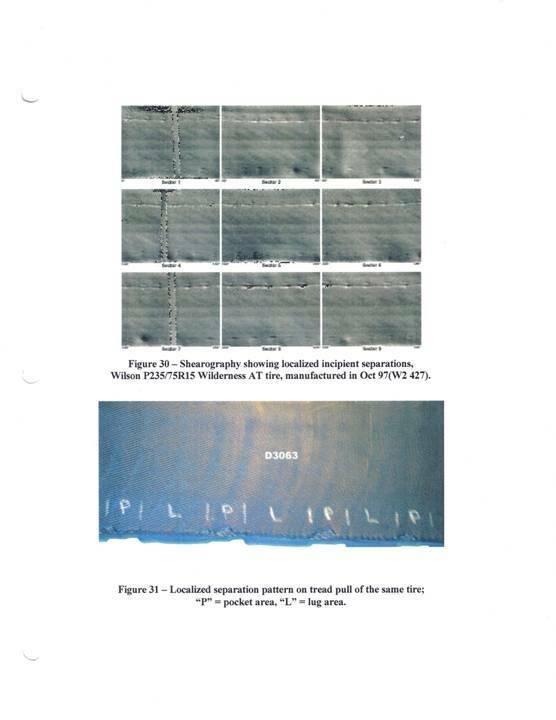 They are shearography images of a partially failed tire - and below is a sample of the top belt showing the small separations detected by shearography. I note that the "P" (for Pocket) areas have separations and the "L" (for Lug) do not. 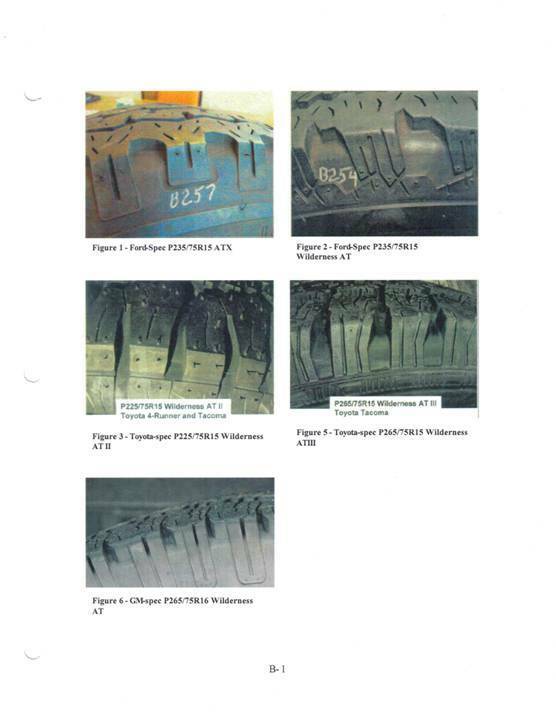 This report shows several of these and shows the same tires at various stages of failure. 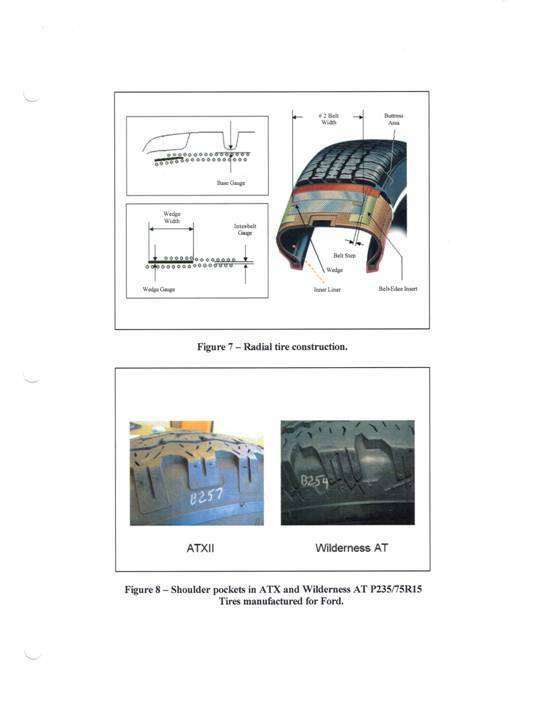 To the right is another image from the report showing various similar tires to the Firestone tires that were recalled - Figures #1 and #2. I think it is obvious what part of the tread pattern is the "Lug", and the gap between them is the "Pocket". Notice that the ATX and the ATX II have a much wider "Pocket" than the others. Please note that the mold for this tire would be the exact opposite - where there were "Pockets" in the tire, there would be "Lugs" in the mold, and where there were "Lugs" on the tire, there would be "Pockets" in the mold. To the left is an image of a guy holding a green tire - which is what they call tires that have been built and are ready for curing. 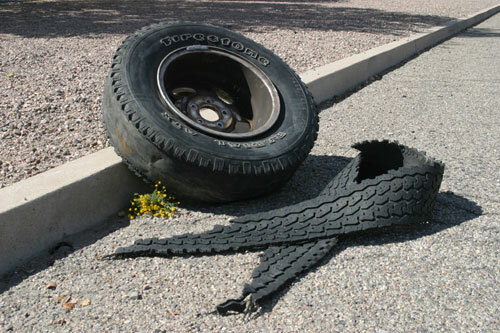 This image is of a Goodyear racing tire, but all tires looks like this before curing. It is in the curing process where the smooth green tread surface gets the tread pattern - and the "Lugs" and "Pockets". That means the rubber has to flow out of where a "Pocket" is going to be molded, into the area where the "Lugs" are molded - and the larger the "Pocket", the more flow. This flow puts pressure not only on the tread rubber, but also on the underlying fabric, especially the belts. I do not know why an uncured tires (or uncured anything) is called "green" - except that this has been called that for a very long time! To the right is another image from the report showing several things - but in particular, the upper left hand corner shows a schematic of the belt edges. Notice that between the ends of the belts - (the thick black line), there is more rubber between the belts. This extra rubber is called the "wedge" or the "belt edge insert" (insert for short). There are a number of ways to do this, but that isn't germane to this discussion. When the green tire is molded, the extra pressure will thin out the insert ever so slightly. This is important as this insert delays the formation of the separation that occurs under the top belt - where the separation normally is first formed. The thicker the insert, the longer before the separation first appears. Even a tire with no insert will not separate right away - and while the addition of an insert delays the time before the separation first appears, there is a law of diminishing returns here - meaning that each additional layer adds less and less to the time before onset of the separation. Please note that the material properties of the rubber are important in determining how thick the insert has to be, so it is futile to discuss the thickness without discussing the material properties of the insert. BUT it is important to note that there was a difference in the way the Decatur plant processed rubber - and hence the Decatur plant would have different material properties for this insert - and therefore would need a different thickness. 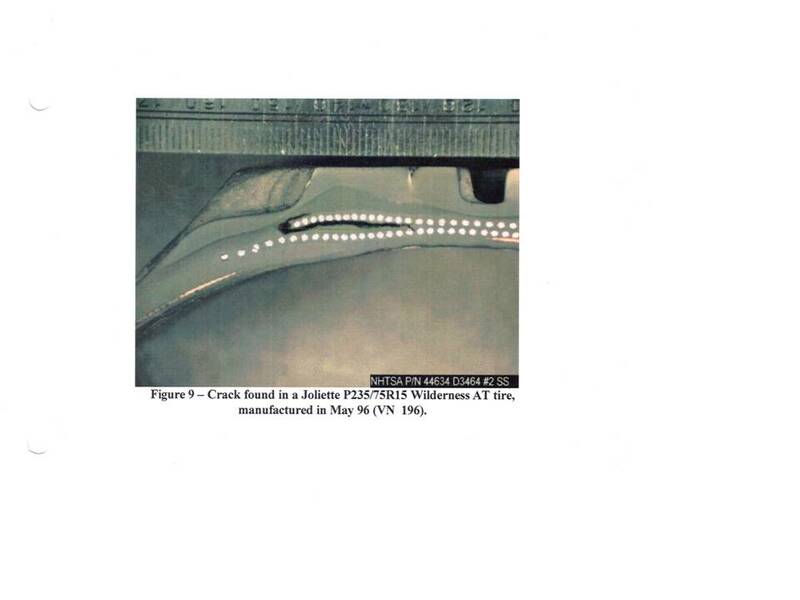 Here another image from the report showing a tire with a belt edge separation. This one is quite far along. 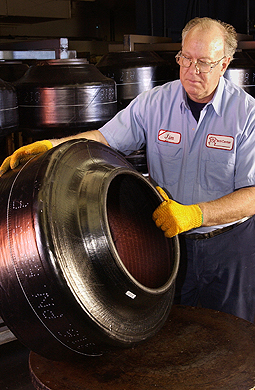 Once a separation in a tire forms, it will continue to grow - around the circumference and between the layers of fabric. Notice that the separation in this tire has progressed inwards under and also around the edge of the top belt. Eventually the top belt will be attached with so little material that the centrifugal forces will overcome the strength of the rubber still attached. At that point, the top belt and everything above it (the tread) will come off. This is commonly referred to as a "Tread Separation", but more precisely, it is a "Belt Leaving Belt Separation". Now to answer the question of whether the tires from the Decatur plant were behaving differently than the tires produced at other plants. Notice that production of the ATX (and I assume this chart includes the ATX II) started in 1994. In 1996, the Wilderness AT was rolled out with the Decatur plant having a significant increase in production until 2000. 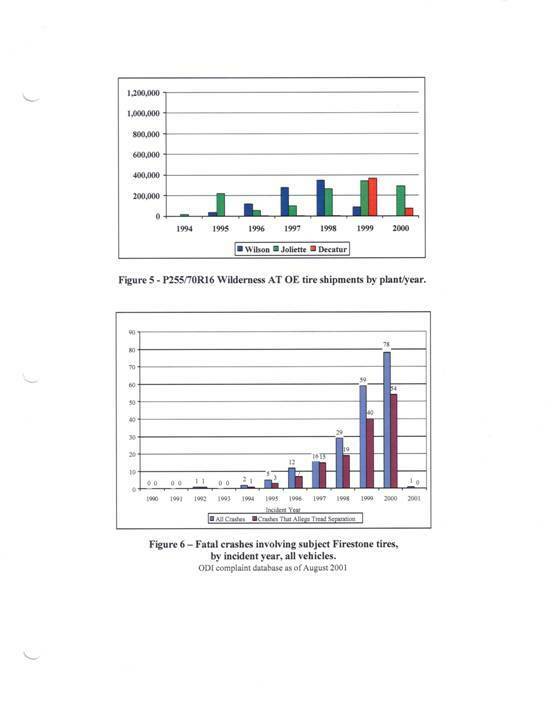 Figure 6 shows just the fatal crashes reported to Firestone involving all the tires involved. Since it takes some time for the separations to develop, one would expect that this increase is attributable to the start of production in the Decatur plant - and escalates from there. But what about the inflation pressure specified by Ford? Notice that the GAWR's (Gross Axle Weight Rating) - the maximum weight the axles were designed to carry - is listed as 2510# front / 2900# rear. The GAWR includes all components that are included in the rear axle as an assembly - the axle itself, the springs and mounting brackets, the hubs, the rims, and the tires. The load carrying capacity of a P235/75R15 at 26 psi is 1753# - and when we apply the 10% derating because the tire is applied to an SUV (This also applies to pickups, vans and trailers. ), the load limit is 1594#, or 3188# for an axle. That means the designed GAWR is 79% of the rated tire load for the front axle and 91% for the rear axle. This means the tire was within the limitations as specified by the Tire and Rim Association - the US tire standardizing organization. Some folks - the USW (United Steel Workers) in particular, who absorbed the URW (United Rubber Workers) in 1995 - have pointed out that the rise in separations coincided with the strike at the Decatur plant (July, 1994 to December, 1996). If the USW were right and inexperienced workers were the cause of these problems, then the Wilderness AT, which started in production in 1996 should have a fairly low failure rate. To the left is another page from EA00-023. 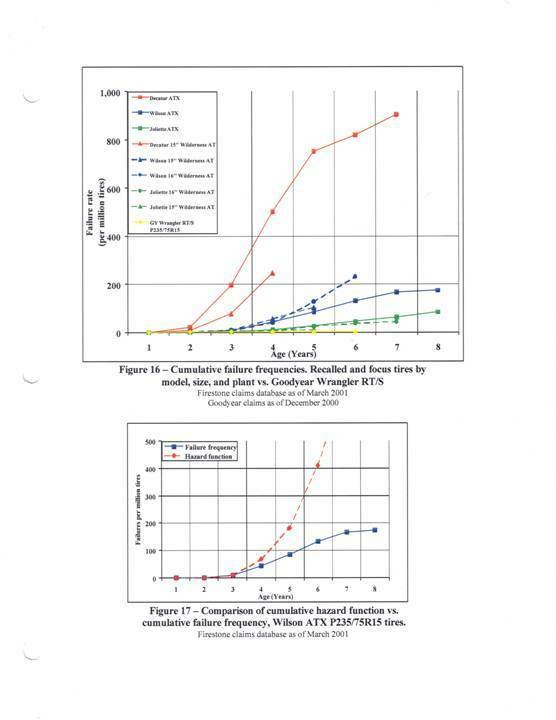 Figure 16 shows a graph of failures of various types of tires. Notice that the Decatur ATX and the Decatur 15" Wilderness AT are more like each other than the other tires. Other folks claim that this problem occurred earlier - in the mid 1970's - to the Radial 500. During the 1970s, Firestone experienced major problems with the Firestone 500 radial. The Firestone 500 steel-belted radials began to show signs of separation of the tread at high speeds. 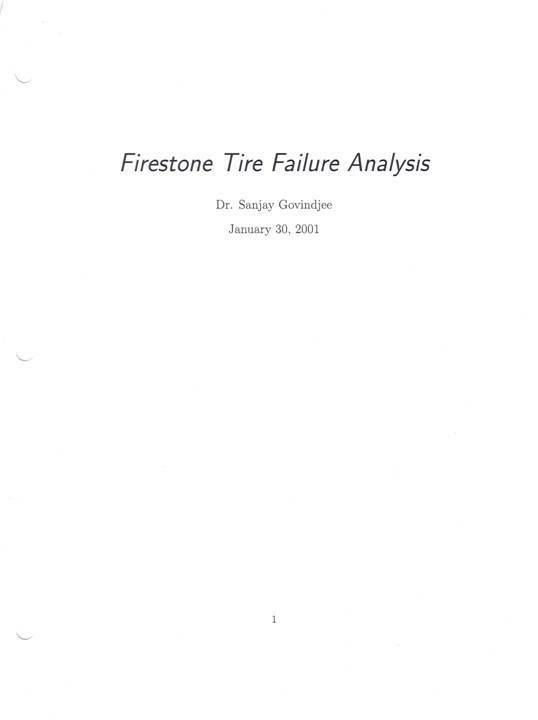 While the cause was never proved, it is believed that the failure of bonding cements used by Firestone to hold the tread to the tire carcass, may have allowed water to penetrate the tire which in turn may have caused the internal steel wire to corrode. Allow me to add that at the time, I was a tire design engineer for one of Firestone's competitors and I vividly remember the questions from OUR management concerning OUR products - and the reassurances came from our rubber chemists! The so-called bonding agent used in the belt skim of the Firestone Radial 500 tires which contributed to an acceleration of corrosion in the presence of high humidity is called HMT (hexamethylenetetramine). This agent produces amines which, in the presence of water, can accelerate corrosion. It was eventually replaced by a similar agent called HMMM (hexamethoxymethylmelamine). I hope that pretty much covers the topic.